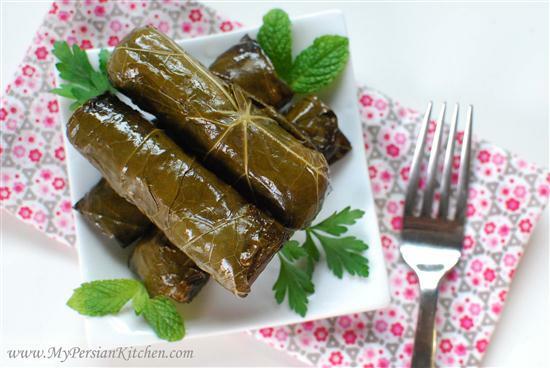 Stuffed grape leaves are very popular in the Middle Eastern and Mediterranean cuisine. 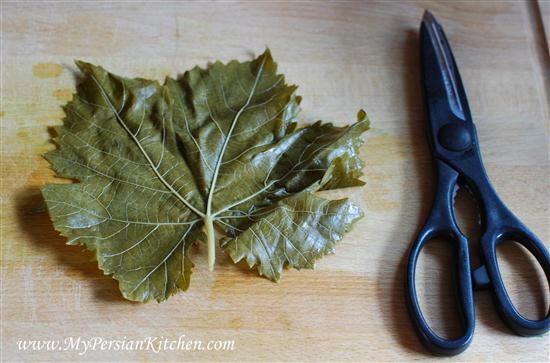 Persian grape leaves are usually stuffed with ground beef and rice. 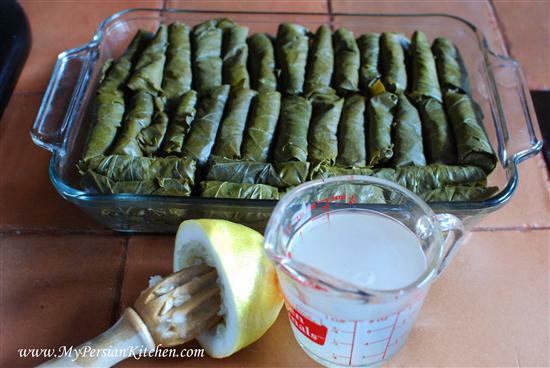 I have always loved stuffed grape leaves and have fond memories of my grandmother making huge pots of it. They are fairly easy to make even though a bit time consuming. But I have to tell you, they are worth every bit of the effort! Small dice onion and saute in some oil until golden. 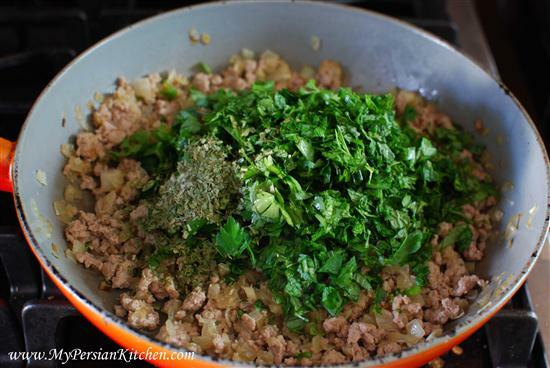 Add minced garlic and ground meat. Season with salt and pepper and cook meat until brown. Then add the herbs to the meat and saute for a few minutes. Cook rice in 3 cups of water and some salt. 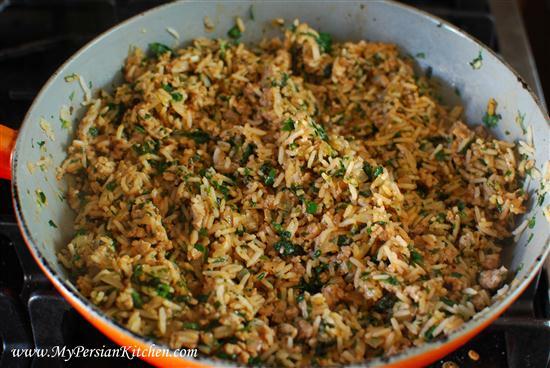 Add rice to meat and herbs. Dilute the tomato paste into 4 tablespoons of hot water and add to the mixture. Adjust seasoning and let cook for a few minutes longer until all the juices have evaporated. 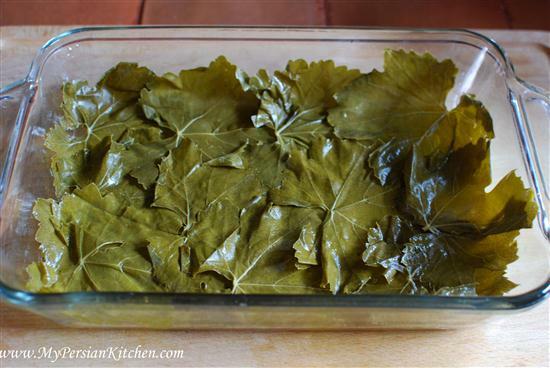 Soak grape leaves to rinse off brine. Place some oil at the bottom of an oven proof dish and spread all over. 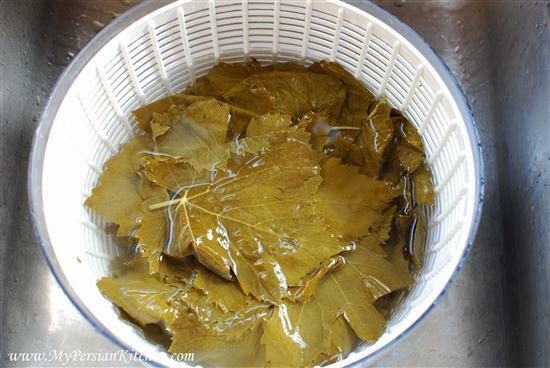 Then arrange some grape leavings on the bottom of the dish making sure that all the surface is covered. Take one grape leaf at the time. First snip off the vine from the leaf with scissors. 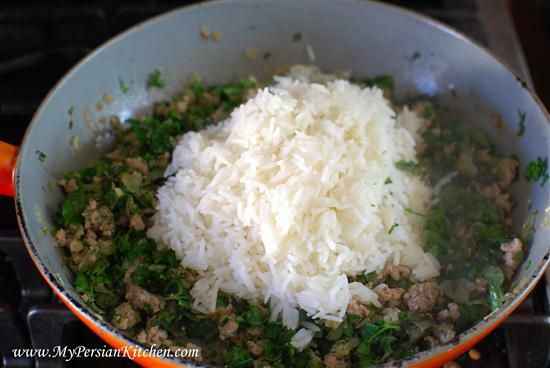 Place 1 tablespoon of the meat and rice mixture on top of the leaf. Roll the leaf closed bringing in the sides so that the rice mixture is sealed in. It might take a couple of tries to get a hang of it. But once you get it, it all goes fast. 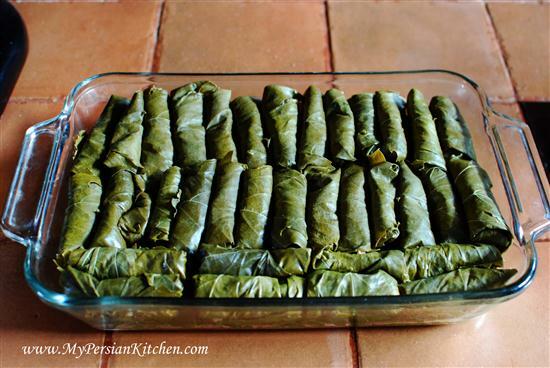 Arrange all the stuffed grape leaves in the platter seam side down making sure that they are all snug. I was able to make 65 dolmehs this time around. The number will vary slightly depending on how big or small your leaves are. Mix lemon juice with 3/4 cup of water and season with salt. Pour over the dolmehs, cover tightly with foil, and bake at at 350° for an hour and half. Add another 1/2 cup of salted water and bake for another half hour. Some people like to place a dish on top of the dolmeh to keep them from opening. It’s important that the dolmehs are closely packed to each other and also make sure to press down the foil on top when covering it. Yum! I’ve always wanted to learn how to make these and now I can’t wait to try! Thank you! I always protest having Dolmeh for dinner because it is so time consuming. Have you tried it with tomato? so delicious. it’s like making dolmeh with bell pepper but instead of bell pepper, use big tomatoes. you have to put the tomato on the top row. Wow, this is incredible! Your family is so lucky! 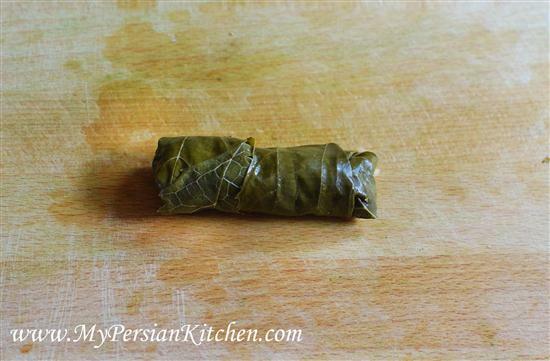 I have to try to make some dolmeh soon. Do you ever make it with out meat? Wonderful recipe! I especially like the use of herbs! 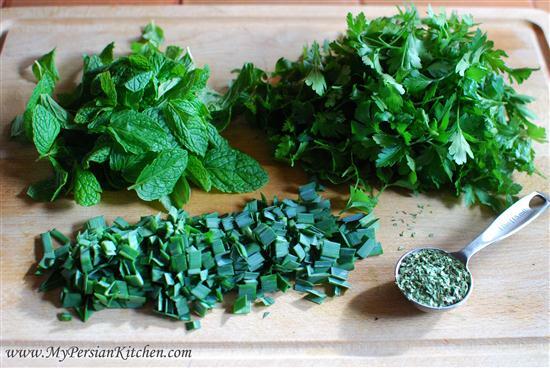 Do you think lamb mince will do with these herbs as well? @ Suzie, It’s time to make them! They are pretty easy!! @ Dr. Faust, I do agree about them being time consuming!! But they are well worth it. I have had stuffed tomatoes. My mom always made stuff tomatoes growing up. They are soo sooo sooooo good!! @ Neomi, you can make dolmeh without meat. I will have a recipe for it sometime soon here. I would add split peas to them though! @ Sneige, yes of course you can use lamb! It’s be even tastier!!! That is an interesting way to make it. Usually I add the rice raw and cook it in chicken broth mixed with lemon and add some onions and garlic to the dolmates (they absorb the onion and garlic and organic broth very well, and this adds to the flavor). Your way is simpler and I am going to try it. I also add some leaves on the top layer so the flavors are kept in while boiling–this layer is later discarded. Then I discard the broth, onions and lemon pieces when they are ready. I use lamb with it and it tastes great with lamb. The secret is chicken broth instead of plain water, to add flavor–makes a world of difference when making it with lamb! I forgot to add, when making these on the stove, the broth with the lemon, onion and garlic pieces in which the dolmathes are boiled is excellent if you have a cold! Like I totally mean it! And you will be thinking ‘I am so not inviting that O. again! @ Bria, I. MUST. HAVE. THAT. MACHINE. STAT! Oh my God, you have just introduced me to something I need to have and have already started the search on the internet!! @ Larissa, you have never heard of my way and I had never heard of yours! This is one of the many reason I love having this blog because I am fascinated by food at many different levels and I am even more fascinated by the different ways in which the same dish is made by different people. Thank you for sharing your way! @ O., you’d be OK in my kitchen as long as you keep me company while you drink your wine and don’t get in my way. I love these at room temperature with a side of libnih (sp? ); that thick yogurt. Good stuff. They freeze quite well too. Thanks for the post. Keep up the good work. Also, I’m making a formal request for an addas polow recipe. Oh. I forgot to mention! When my Mom makes this dish, she uses some of those unripened grapes in the pan along with the dolmehs. She also uses uncooked rice, but your method is easier for me to do; the dolmehs won’t explode when the uncooked rice cooks! 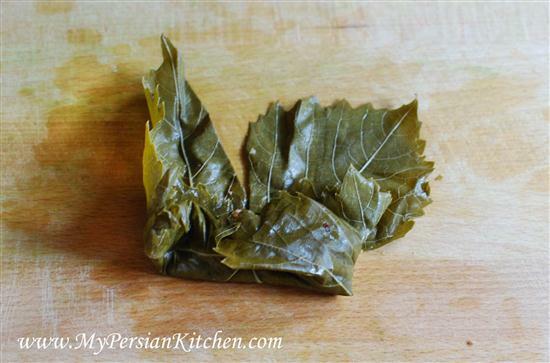 I think that it would be so amazing if you could do another version of the Dolmeh, the version that my grandmother and some Iranians love which is the sweet/sour version. Sekanjebin or lemon juice/sugar is used for that effect and it has to be strong so that you can taste the sugar/sourness in each dolmeh and not just the ones on the bottom. Also, my grammy used Zereshk and lapeh in her dolmehs which gave them this jewel like look. Love your blog. I cook and am a SAHM and your blog is the only Iranian one I like. 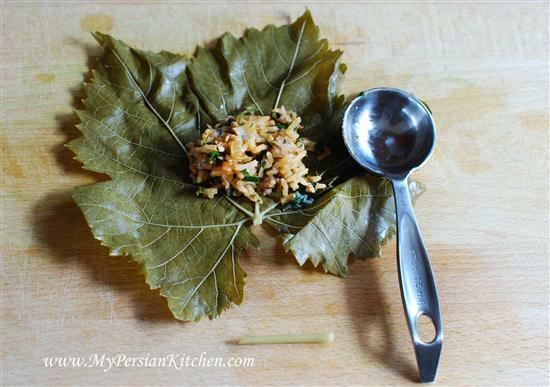 savory is a main part of any DOLMEh (Dolma) in Persian cooking. We also add yellow spit peas, barberries, whole cumin, tiny chopped tomatoes, and current raisins. Hello, I have been looking at all your recipes with great interest, especially your dolmehs, and find your recipe quite different than the usual ones I follow. I make them with and without currants, and use dill, chopped sweet onion, such as vidalia, parsley, and green onions, or chives, but no mint. 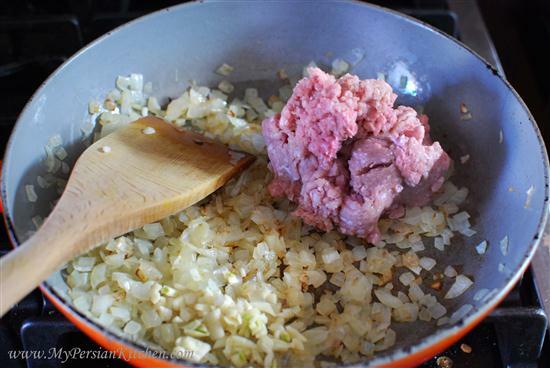 I also do not add garlic, but think it would be a wonderful addition to the dolmeh made with ground meat, and will be sure and try it next time. The recipes that I use also call for cinnamon and/or allspice, as well as salt and pepper, and of course, lemon juice and water as cooking liquid. I do partially cook the rice, and saute the vegetables with the meat before mixing and ‘rolling’ the dolmehs. 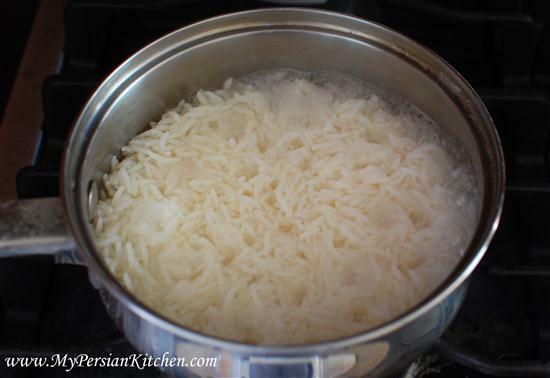 Diana, I have also come across different recipes for Dolmeh. People have their own way of making them depending on who they learned it from and what type of personal adjustments were made as he recipe was passed down. Thank you for sharing your recipes. I add dill, mint and Turmeric to my meat mixture. Does anyone know how long the Dolmeh stay good after they are made? I am having a party in 6 days and will the Dolmeh still taste good if I made them today? I’ve been looking for an inspiring dolmeh recipe recently, and I’m happy to say this one was great! I dislike tarragon for it’s strong anise flavors, so I omitted it, and mixed in about a cup of dill to add a touch of brightness, but otherwise, I followed the recipe as written. I’ll be saving it as my standard reference from now on. Delicious!